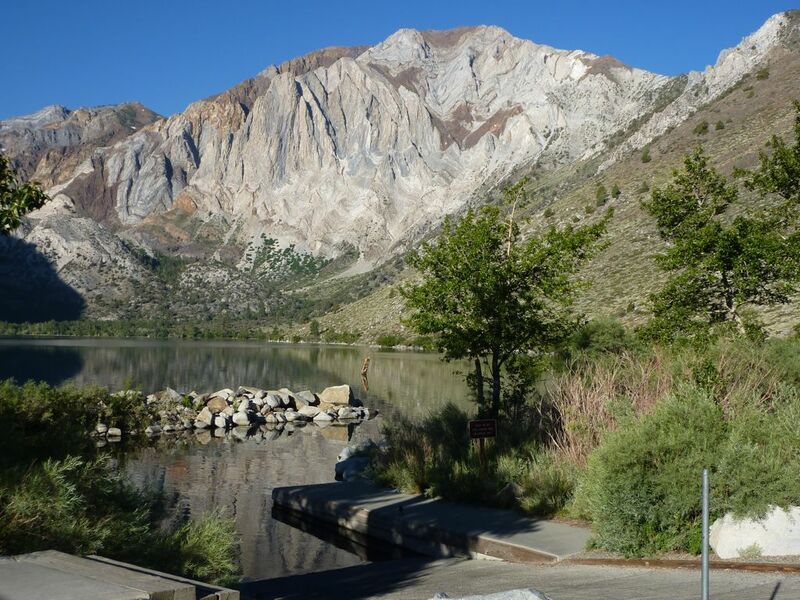 After a day off to get my stuff back in order — wash all my t-shirts, throw away two pairs of destroyed shoes — I took an easy day to climb Mount Laurel, a short hike from Convict Lake, south of Mammoth. Like Baldwin, Laurel is in a region of incredibly loose rock (shale and sandstone, I think), but the east gully route presumably floods enough that the loose rocks are washed away, though sand remains. Though it’s rated 5.2, most of the climbing is class 2-3 on blocky red rock or white slabs, with a bit of 4th class here and there. I got a leisurely start at 7:45, cruising the trail to the dry wash and talus field below the gully, and entered it via the rock to its left. For awhile, the climbing was mostly class 2, moving into the gully or to either side to minimize loose rock and sand. I saw several pairs of footprints in the sand, not surprising on a well-known route with a short approach. The crux of the gully was probably a 20-foot crack above a small sand basin. Though it would have been trivial on granite, the sandy water-rounded sandstone had few positive holds, and it took me a minute to figure out the right sequence of moves. Above that, I followed a stripe of blocky, red, relatively solid rock for awhile, leaving the gully to the left. I clearly haven’t completely recovered from the Challenge, because I was climbing slowly, and felt a bit light-headed sometimes. I looked at the traverse back into the gully, but decided instead to climb a ridge to its left, which was probably not part of the original route. The ridge steepened to tricky class 4 on a mixture of rock: gray, friable sandstone, harder white sandstone, and the blocky red stuff. I tried to stay on the white and red, eventually making my way to the crest, and along red and gray talus to the summit. The descent is a fast walk-off down the north ridge, then back to the southeast toward Convict Lake. I found a faint use trail along the ridge which disappeared, but guessed the correct gully for the southeast turn, and found the trail again as it turned onto a steep dirt slope. The descent was fast but unpleasant, with fine ankle-deep dirt and low brush. However, the path was easy to follow, and I soon regained the trail and jogged back to Convict Lake. Looking up from the big red stripe. Looking northwest across the face. View down from above the gully. Ritter range from the summit.